I posted here about writing a novel and writing in general. Of the stages of writing, the early creative planning is my favourite part. It’s where the characters are turned into real people, where they grow and develop and pop out into 3D. I’ve been working on a new idea for a while now. It jumped into my head in the middle of a meeting one day at work and has been bounding around since then, getting bigger and more in focus. I’ve now sorted out pretty much everything – characters, names, places, tone, mood, plot, story, narrative – but there’s a few things that I want some help with as I start writing, a few of the smaller details. And guess what?! This story is about beer (here’s the gist: think American Psycho meets Sideways (the film, not the book - the book is unreadably bad) meets Perfume in a brewery). 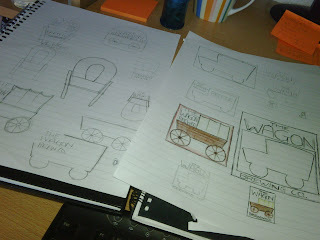 The Wagon Brew Co. is sorted and I know the plan for it. But the Second Sunday Brewery beers have not been finalised. The brewer’s name is Chase Burton. He’s a celebrated home-brewer who decided to start his own commercial brewery. The story begins as he is winning an award for best beer at a beer festival. His core range will involve the expected pale ales, IPAs, stouts, ESBs, plus DIPAs and imperial stouts. There will also be a few Belgian styles and ‘clones’, for which he is well known. There will also be some barrel-aging. And here’s where I need your help: I need beer names, I need beer descriptions, I need creative ideas for new beers. The brews can be strong or weak, pale or dark, lager or ale, one-offs or regulars, cask-only or keg or bottled. Just go crazy and throw a load of ideas at me but remember that this is fiction and not fantasy, so keep them real and possible but take inspiration from anywhere and feel free to experiment with different ingredients and styles. If any stick and I like it then I’ll name a character after you. Whenever I tell a mate that I’m writing they always ask if they are in it. I don’t know why. Oh and I posted the picture at the top to twitter this morning. I was working on the quick and early designs for The Wagon’s logo. If anyone has any ideas for what it could look like then let me know. And if Second Sunday inspires anything in you then shout as I haven’t finished that logo yet either. If it makes the big screen, I'll offer to write the theme tune. 20%+ Black Larger. Always thought such a thing would be cool. If it's even possible. Probably sold bottled, kinda like Port - eat with cheese... Or maybe dark chocolate. Christmas special? Or is that a little obvious? Not sure about barrel aging or not. Perhaps. Jimbeaux, I don't think lager yeast can be pushed up to 20%+?! I know the brewdog/stone/cambridge collaboration is a strong black pilsner but it's not THAT strong! The strongest beer I've had was 18% and that was similar to a port just with more oomph. Please, Sir, I Want Some Moor?